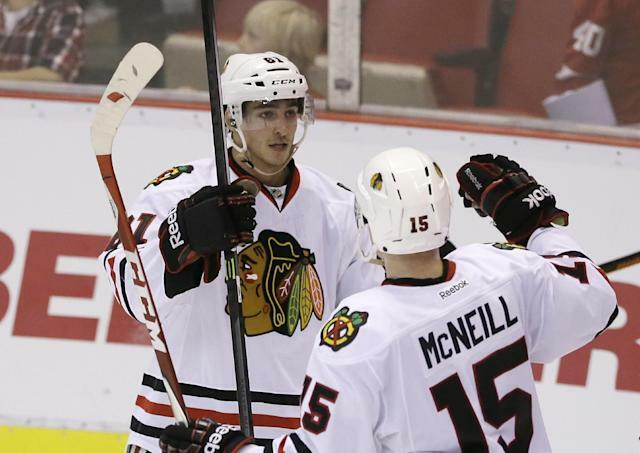 Garret Ross is a 23-year-old winger for the Rockford IceHogs, the Chicago Blackhawks’ AHL affiliate. He didn’t play in their games over the weekend, with coach Ted Dent saying it was a “coach’s decision,” according to Chris Block of Third Man In. Officials say back in August (2015), the player shared a photo of a woman "engaged in a sexual act, which was obtained under circumstances which Ross should have known the image was to remain private." Officials say Ross also should have known the woman "had not consented to the dissemination." Under the new law, non-consensual dissemination of private sexual images occurs when an image of a person over 18, who is identifiable from the image or information displayed with the image, is engaged in a sexual act or “whose intimate parts are exposed, in whole or in part,” the image was obtained “under circumstances in which a reasonable person would know or understand that the image was to remain private,” and where the person depicted has not given consent for the dissemination. In addition to the possibility of jail time, the property of a person violating the act is subject to forfeiture. As you can see, the offense date was Aug. 31, 2015. Ross has played 59 games this season for the IceHogs, with 7 goals and 13 assists and 107 penalty minutes. It’s unclear at this point when Blackhawks management knew of the charges against Ross. The case has been ongoing. A plea hearing in February was postponed and is now scheduled to take place next Monday.